The small changes are often the ones that make a difference. Our guide presents effective, light-touch strategies to help your students get to and through college. Sometimes all students need is a nudge. Students face many obstacles on the path to and through college. In recent years, innovators and researchers have explored how insights from behavioral science—the study of how we make decisions and take action—can help students overcome these challenges. We compiled the most effective of these “nudge strategies” for educators like you in Nudges, Norms, and New Solutions, a free and easy-to-use guide. Simple, behaviorally-informed efforts like coaching and eliminating small application obstacles may be the key to giving students a leg-up on getting into college. 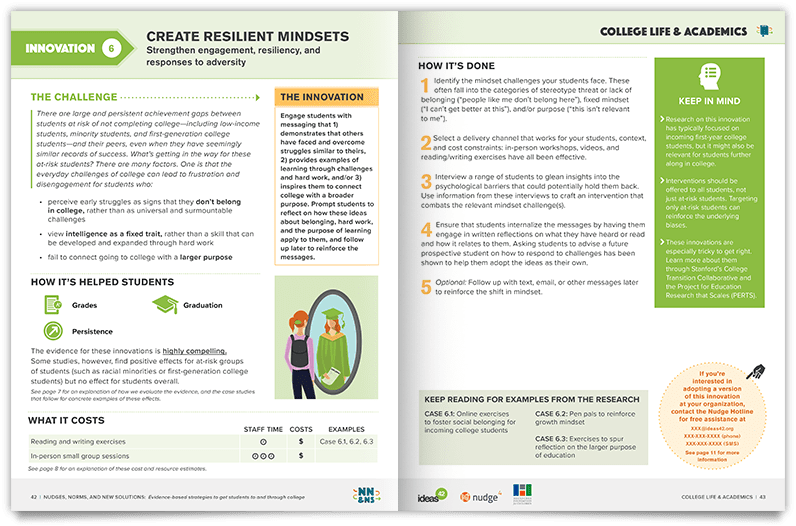 From goal-setting to helping students side-step potential roadblocks, simple innovations can help you increase your students’ ability to thrive in college. The guide contains 5 solutions that can help students succeed academically. 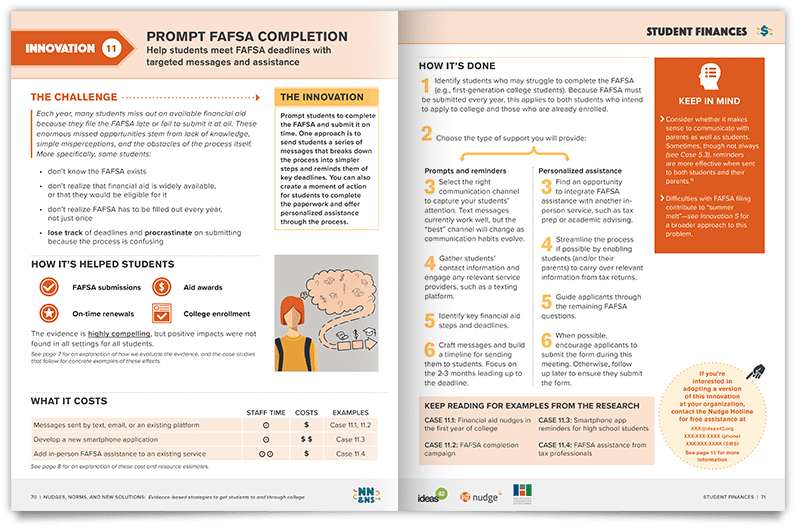 Simple tweaks to Financial Aid conversations, like prompting FAFSA submissions and reframing borrowing choices, could help students make informed financial decisions about college. 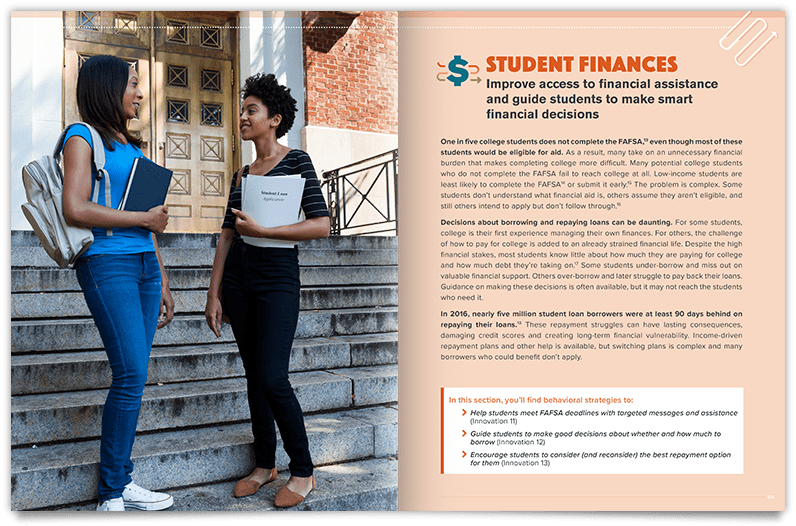 The guide includes 3 strategies to help students navigate their financial options. 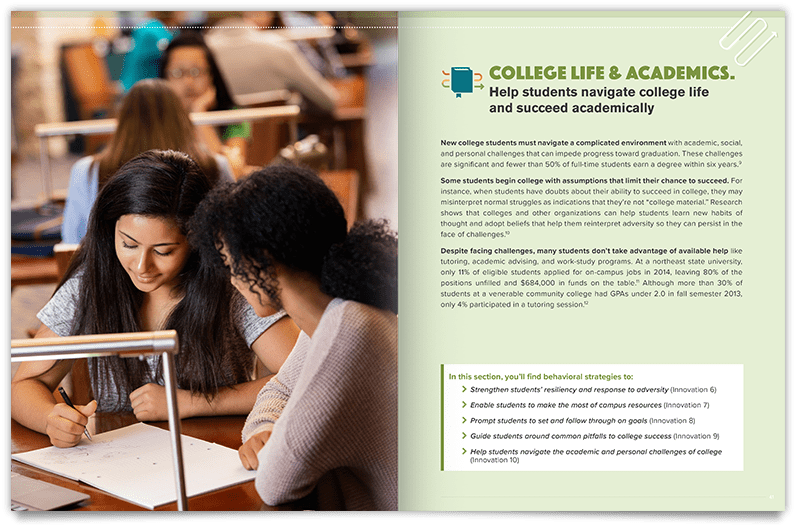 Behavioral science meets college student success in Nudges, Norms, and New Solutions—the all-new, hands-on Guide for practitioners helping students enter and successfully complete college. The Guide—available at no cost to educators—provides solutions to the behavioral barriers preventing students from succeeding beyond high school. Funded by the Heckscher Foundation for Children, this project was developed collaboratively by Nudge4 and ideas42 and synthesizes evidence-based behavioral strategies to improve college access and success. The Nudge4 Solutions Lab at the University of Virginia partners with public agencies and organizations to design and test scalable strategies to drive educational and economic opportunity for all Americans. Nudge4 projects harness a unique combination of behavioral economics, data science, and interactive technologies to identify people most in need of support and provide these individuals with highly tailored pathways to educational and workforce opportunities that position them for economic success. ideas42 has a clear mission: to use our unique experience as a nonprofit at the forefront of behavioral science to change millions of lives. We create innovative solutions to tough problems in economic mobility, health, education, safety and justice, consumer finance, energy efficiency and international development. Our approach is based on a deep understanding of human behavior and why people make the decisions they do. Working closely with our partners from government, foundations, NGOs and companies, we have more than 80 active projects in the United States and around the world. For nearly 100 years, the Heckscher Foundation for Children has worked to level the playing field for underserved youth, principally in New York. We support innovative, results-driven programs and partnerships, and focus our giving on education, including college access and persistence, workforce training and jobs access, and arts education that improves achievement in the classroom. Our venture philanthropy approach uses three principal funding strategies—catalytic giving, strategic partnerships, and targeted problem-solving—that look for inflection points where our funding has the potential to change the course of a young person’s life at a key juncture. Nudge4, ideas42, and the Heckscher Foundation for Children are proud to partner with former First Lady Michelle Obama’s Reach Higher Initiative to launch Nudges, Norms, and New Solutions nationwide on May 2, 2018, in conjunction with College Signing Day. This event, hosted around the nation by schools, organizations, community leaders and celebrities, is a chance to rally around students who have committed to higher education and inspire others to follow in their footsteps. The Guide helps advance the Reach Higher mission to improve postsecondary access and completion for economically disadvantaged and underrepresented students in our country. Please fill out the form below to receive your printed copy of the guide. Get free one-on-one support from a behavioral scientist to tailor a nudge strategy for your students. Fill-out the form, call us at 434.233.0165, or email us at nudge4lab@virginia.edu. We'll get back to you within 48 hours. Need a nudge yourself? 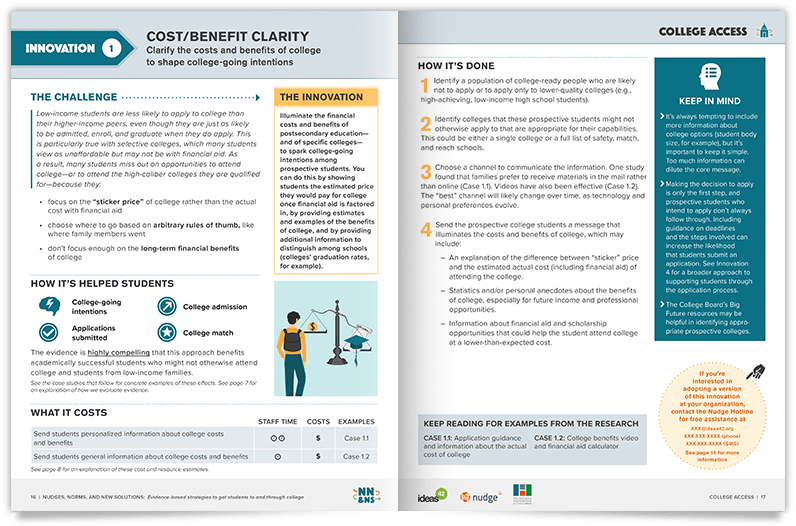 Check out our evidence-based guide for educators, designed to help get students to and through college.